These walkway landscaping pictures may provide you with design ideas for your own yard. My photos of walkways show examples of the variety of materials used for walkways (paths). Walkways may be curved or straight, and some builders select the construction material so as to match or complement the home to which the walkway leads. Want to wend your way from street to front door on something more attractive than a plain, utilitarian path? 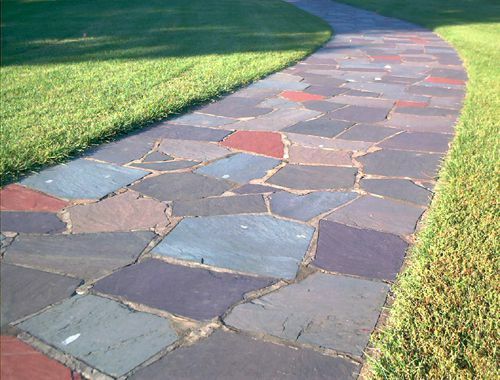 Flagstone walkways can inject some color into the landscape design, as this winding path illustrates. Building curved walkways softens the landscape by counteracting rigid lines -- for example, a rectangular house, a straight driveway, etc. For more information, see my FAQ on building curved walkways. Instead of meandering along, it unashamedly makes a beeline for the front door. The material in the walkway matches the material used to construct the house. Cobblestone walkways are sometimes a bit harder to walk on than paths composed of other materials, but they unquestionably exude an Old World charm. Not only that, but walkways made from concrete pavers provide a uniform, level surface on which to walk. This paver walkway is another example of a straight path. Straight lines make sense for walkways whose purpose is essentially utilitarian (for carrying groceries in from the car to the door, for instance, you may not want to have to walk a winding path, regardless of its potential charm). For informal paths, stepping stones are suitable. In my article on garden stepping stones you can learn how to make, install and landscape around these easy-to-build walkways. The two sections of brick walkway are punctuated by landscaping stairs. The stairs facilitate the climb up the hill, breaking up what would otherwise be a long trek. Granite walkways say, "classy!" This granite walkway is nicely adorned with spring plants on both sides. Colorful plantings help soften the look of granite walks, which otherwise might come across as rather austere. Planting tulips here was a stroke of genius. But in this picture, we see a path with light-colored flagstones. Note that the flagstone walkway ties in nicely with the boulder arrangement in the background. By "non-masonry" paths I'm referring to paths that have some "give" to them when you walk on them. Stone products can be used on such pathways, but the stone will have been pulverized. For example, non-masonry paths may be composed of fine gravel, decomposed granite or stone dust. But other materials can be used, as well, including bark mulch, although the latter is obviously less durable than a product such as stone dust and will need to be replaced frequently. Such paths offer an alternative to such masonry walkway materials as brick and flagstone.